By curbing the inclination to act impulsively, you can improve relationships and avoid entering the stress/rudeness vicious circle. When disagreement occurs. A discussion in which people don’t agree turns personal rather than remains focused on the issue. When time pressure builds at work. The deadline for a column causes the author to be curt with others as he attempts to turn it in on time. When people are asked to do more with less. Downsizing is tough on those let go, but it also places additional demands on those still on the job and leaves them wondering if they might be next. When technology builds an electronic brick wall between people. A person receives a less-than-friendly e-mail and rather than taking the time to cool down first, fires off an angry response, starting a chain of angry e-mails. If you had a blood pressure cuff on people at the time these situations happened, you’d see their readings increase— sometimes dramatically. In each case, it’s easy to imagine the stress level in the office or between the people involved sky-rocketing. 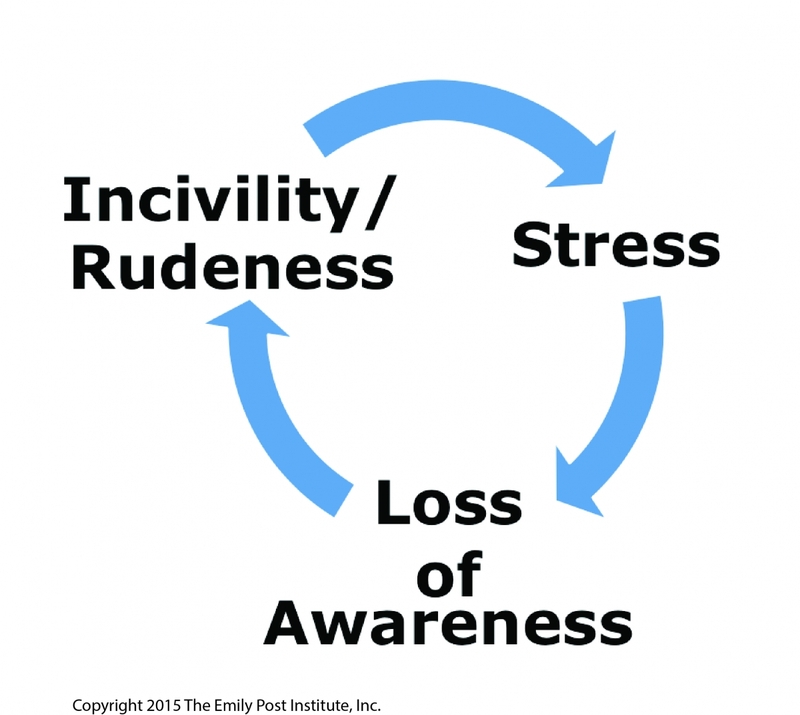 Unfortunately, the resultant stress increases the odds for rudeness to occur, and that can lead to the stress/rudeness vicious circle. The vicious circle begins when stress increases between people. As it increases, it leads to loss of awareness as the stressed person becomes more focused on him- or herself and not on how his or her actions are affecting others. In turn, that loss of awareness leads to actions that, at the very least, appear rude. The rudeness, in turn, ramps up the stress the affected people feel. And now all parties are ensnared in the stress/rudeness vicious circle. Another stress factor is introduced when people act impulsively, doing the first thing that comes to mind without thinking about the consequences. For instance, Tom and Andy are having a conversation and Tom’s cell phone rings. Without thinking about the effect on Andy, Tom answers his phone, leaving Andy to think Tom is pretty rude. So Andy throws his hands up in disgust and walks away. Tom perceives Andy’s action as rude and way over the top and, suddenly, they became trapped in the stress/ rudeness vicious circle, all because of two impulsive actions: Tom answering his phone and Andy’s impulsive response to Tom’s action. Had Tom stayed his hand for just a few seconds while his phone was ringing and focused on how answering it might be perceived by Andy, he might have chosen to send the call to voicemail. Andy would have noticed the action and instead of being frustrated with Tom, he would have appreciated the non-verbal signal that Tom considered their conversation to be more important than a phone call from who knows who. Peter Post is a director of The Emily Post Institute (http://www.emilypost.com/seminars), great-grandson of Emily Post, and co-author of “The Etiquette Advantage in Business."